“Bhatta Basti in Jaipur is notorious for child labourers who work on lac bangles within their households. Most of the adult members are either jewellers or unskilled labourers. Substance abuse among children and adolescents is high. Dropouts are common as children become workers early on in life”, says Magic Bus’ Neelima, who is in charge of the programme here. There are 500 children in the Magic Bus programme in Bhatta Basti. Do they go to school? “Yes. A few of them work in household industries like bangle-making, but they also go to school. Initially, when children came for the sessions, they used foul language and were into substance abuse. This has changed considerably. Our work is a challenging one. Consider this: If a child spends two hours in the sessions learning the importance of education and the disadvantages of substance abuse, she also spends the rest of her time in the community where substance abuse is the ‘style’, with every other child being compelled to work than study. Therefore, we also work with parents, caregivers, community members, institutions within the community to ensure that a child does not lose out on her formative years”. Such is Bhatta Basti. It looks a bit different from the shanties that dot the landscape of megacities like Delhi or Mumbai. There are rows of pucca houses here – with exposed red bricks and high ceilings. Many houses have no roof. An open drain underlines the sorry state of hygiene in the area. People who call Bhatta Basti home are largely from a single community engaged in bangle-making, stone-cutting, and tailoring. Let’s walk along the meandering, narrow lanes of Bhatta Basti, along a partially hilly landscape to hear the story of a 19-year-old who lives in the area and whose story wants to be told. For Mohsin Farukhi, this was a question he had carefully avoided since he was 13 and stopped going to school. “My father worked as a stone-cutter in a nearby shop. My elder brother joined him after he finished his seventh standard because we were in desperate need of money. My younger brother failed in the eighth standard and started work at a local watch repair shop. My father stopped going to work once both my brothers started earning. When they got married and had their own children, they could barely spare any money to support the family. My elder brother earns Rs. 7000 a month while my younger brother makes Rs. 8000. This is why my parents started putting pressure on me to start working”, explains Mohsin. Consequently, he dropped out in the seventh standard and started assisting in a shoe shop where he was paid Rs 5 for working 12 hours in a day. “My father dropped me to my first workplace. I could never tell him how much I wanted him to drop me to a school instead”, Mohsin looks away as he shares the memories of his first day at work. He didn’t stick to his first job for long. He soon made friends in the neighbouring stores and found out a different place to work with better pay. “I realised one thing: there will always be jobs available for children like us because we can be paid less and made to work more”. While Mohsin worked for longer hours in jobs that did not interest him, his father started working as a priest (locally called mohzim) in a dargah. His mother is a homemaker. With three of their children working and two of them married with children, the family decided to build a pucca house in a different locality. So, they shifted to Bhatta basti area. “We could only afford a pucca house near an open drain. Its stench is unbearable on most days, but we are used to it. Sometimes it overflows, but we have learnt to live with that too”, Mohsin shares. Three years ago, Mohsin came to one of Magic Bus’ sessions. He was 16 then. 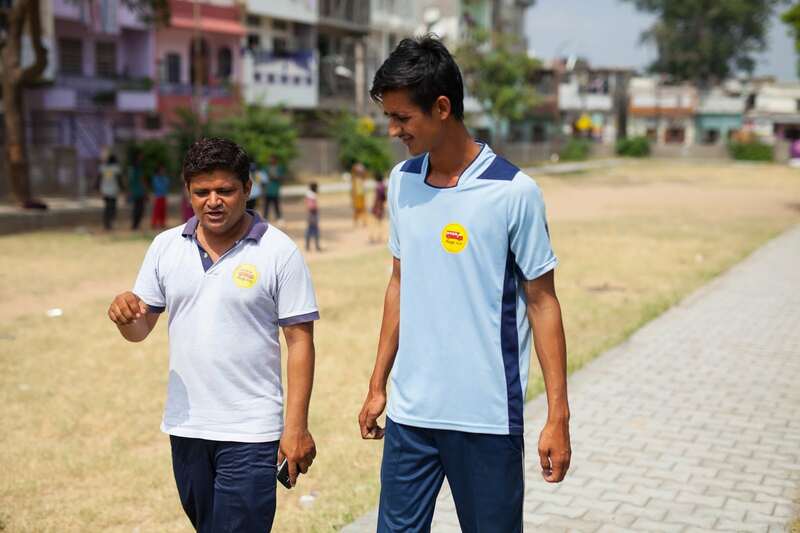 Having never had the time to play, Mohsin took a strong liking to the activity-based session. “The person leading the session sat us down in a circle and asked how many of us went to school. I saw several hands in the air, and ran away”, he recounts. Sarfaraz, who was conducting the session that day, saw Mohsin leave in a hurry and decided to find out more about him. He called upon him the next day while he was leaving for work. Mohsin confided in him his eagerness to learn. 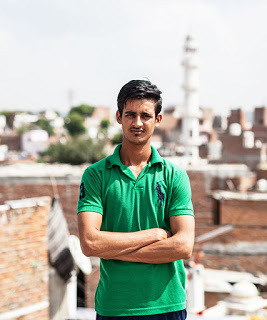 “If you want to go to school, who is stopping you?”, Sarfaraz asked. Mohsin explained his situation. That day, Sarfaraz left Mohsin with a hope, “You can still study. I will help you get re-enrolled”. The support he was looking for came to him in the form of a mentor he could trust. When Sarfaraz spoke to Mohsin’s parents, he found out about the abject condition they were in. “Without Mohsin working, how would we manage to make ends meet? I have no income option at all”, Mohsin’s father said. Sarfaraz approached an NGO and mobilised funds for Mohsin’s education. Mohsin negotiated with his father to allow him to go back to school in return of working to support the family. After a period of three years, Mohsin went back to school. He got enrolled in the tenth standard in a private school. “He was concerned about which class to get enrolled in. “I don’t look like a boy from the seventh standard. Everyone would make fun of me in school”, he would say. We consulted the teachers at the private school and got him enrolled in the tenth standard”, recalls Sarfaraz. Mohsin’s challenges were far from over. “I found the lessons difficult. After all these years, I found it difficult to concentrate. It was exhausting to work and study simultaneously”, he shares. Unfortunately, He failed the tenth examination. “His parents persuaded him to discontinue education. They didn’t think it was a worthy investment. But, Mohsin persisted in his attempts. And, of course, we stood by his decision”, says Sarfaraz. Today, Mohsin has completed his 12th standard. He aspires to become a nurse because getting a MBBS degree would be too expensive for him. “I am, by far, the most educated in my family. My parents never went to school and my brothers dropped out. I don’t want to stop here. I want to study further and work in dignity”, he shares. Mohsin is firmly on the path to a brighter future, but there are millions of boys just like him across South Asia that still need your support.